This title has been available on the Xperia play for quite some time now but Gameloft has finally brought it over to iOS. While this is Gameloft‘s first Unreal Engine 3 game on iOS, it will be interesting to see how the game will measure up to other Unreal Engine 3 games on the iOS App Store. So, read our full review below to see how it measures up. Even though the game is made with Unreal Engine 3, it’s not up to par with other Unreal Engine 3 games made for iOS like Infinity Blade for example. This is alright though. BackStab is the best looking game on the iOS App Store I think. The detail of the environment and characters in very noticeable and looks fantastic. The character animations are typical Gameloft style but that is alright. This was just an introduction with Gameloft using the Unreal Engine 3. I can’t wait to see what else they have planned. 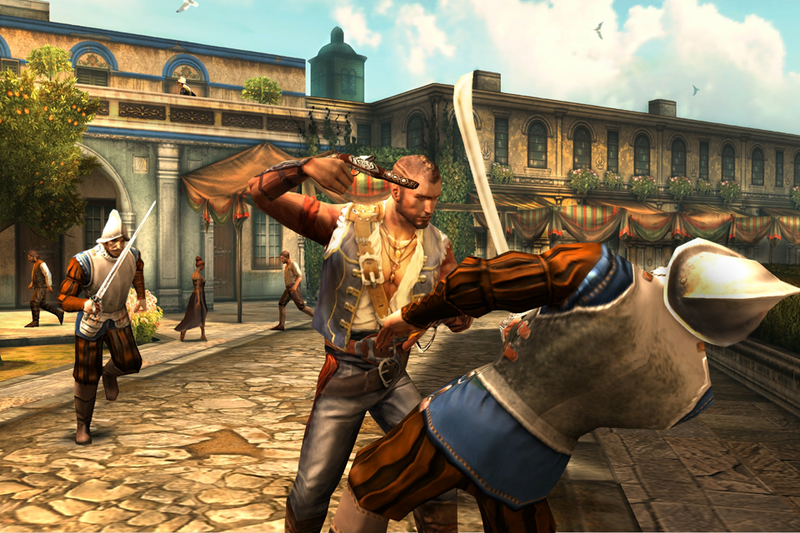 The gameplay is very like the well-known console game and even iOS game, Assassin’s Creed. There is an open world where you could just run around the city and kill civilians, or you could follow the quest line. You play as Henry Blake. A Captain of a ship that was betrayed.. You have the usual joystick on the left for movements. To the right, you have a sword icon for combat, and an iron sight icon for your sword (there are also bombs in the game bit they are not widely used). Above these 2 controls there is a button that you can use for jumping and various others things in-game. The game is an open world, so you can do the quests and side quests or you can go around killing random people. There are a lot of quests to do and the game has great replay value because of the open world. BackStab is a universal app and like a lot of Gameloft games it cost $6.99. This is Good deal for what the game gives you. Gameloft always delivers on games and that is why the dominate the iPhone gaming market. They are the Activision of the app store. The price is perfect. The games buttons never get in your way of the beautiful graphics. The on-screen joystick only appears when your thumb is there. This way you can see more of the on-screen action. It’s a good UI. The composer who wrote the music in this game is VERY talented. Everything sounds great, from the sword sounds to the menu song. Everything sounds very realistic. This game, like a lot of Gameloft games is fantastic. I did however have the game crash on me a few times. These crashes were very rare. And only happened a few times. For 6.99 this is one great game that ha replay value and loads of missions. I give BackStab a 9/10. ← Pocket Academy by Kairosoft is now out! Entries (RSS) | Comments (RSS) | 87 queries in 0.482 seconds.